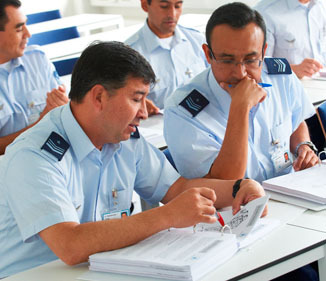 Aviation course’s are flexibly structured and designed to meet the needs of Pilots and ATCO’s. Programmes adhere to ICAO guidelines and are designed to take candidates to ICAO Level 4. The Aviation sector is an international environment where English language skills are essential. JAA Guidelines stipulate pilots and ATCOs must have achieved ICAO 4 as a mandatory requirement. Programmes are by arrangement. Interested in a Aviation English Course? Berlitz Dublin offers flexibly structured Aviation English training courses in Ireland for pilots and ATCOs. Our English language courses are adapted to meet the guidelines in the ICAO English language proficiency descriptors and can be structured to meet the precise requirements of individual sponsors. We employ JAA-accredited trainers and testers to oversee flexible training in English for aviation, with appropriate ICAO-compliant testing and certification. All of our courses are professional and use the latest course books and material to assist the learning process. Course duration can be between 2 and 24 weeks, depending on the English language entry level of participants and the precise requirements of respective aviation sponsors. We offer ICAO 4 preparation as well as refresher courses. This programme is designed to meet the needs of sector professionals whilst having the flexibility to allow tailoring to specific interest groups; whether pilots, ATCOs or other Aviation Sector professionals.